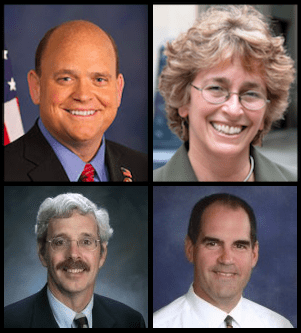 (Clockwise from top left): Congressman Tom Reed (R-Corning); Candidate Martha Robertson (D-Ithaca); Candidate Barrie Yochim (D-Jamestown); Republican Andy Goodell (R-Chautauqua). DUNKIRK – Congressman Tom Reed (R-Corning) and State Assemblymen Andy Goodell (R-Jamestown) – who are both running for reelection this November – were in Dunkirk Thursday afternoon to speak out against a lawsuit involving the NRG Repowering Project. The two explained that the lawsuit filed by the Sierra Club against the state Public Service Commission is frivolous and if successful, would harm not only taxpayers in the Dunkirk area but also those across the county, because NRG is the largest tax payer in the county. The lawsuit is scheduled to be heard Nov. 7 in Albany Supreme Court. The event coordinated by Reed and Goodell did not include appearances by their respective opponents, Martha Roberston (D-Ithaca) or Barrie Yochim (D-Jamestown), both of whom also oppose the lawsuit. Yochim has said he also opposes the lawsuit and if his schedule allowed it – and had he known of the scheduled news conference – he would have also been on hand to publicly announce his opposition to the lawsuit. Robertson’s campaign has also made it clear she does not support the lawsuit, even though the Sierra Club has endorsed her as a candidate. In the same statement, Robertson also went on the attack against Congressman Reed. “Once again, Congressman Tom Reed is making false, negative attacks against me,” she explained. “I am clearly on the record supporting Dunkirk repowering. He is deliberately misleading voters, and refusing to face me in a televised debate in Western New York, because he can’t defend either these false attacks or his own failed record. Chautauqua County Democratic Committee Chairman Norman Green was critical of the Reed-Goodell news conference and released a statement Thursday night criticizing Congressman Reed. In the release, he called the event a shameful substitute for a debate on the issues. 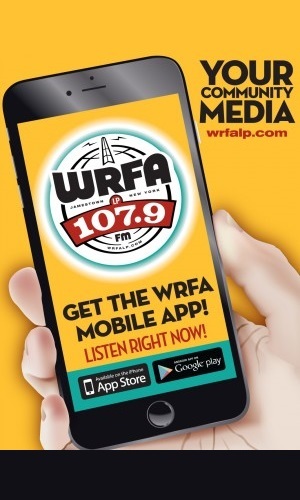 Green also said that Reed should be more willing to debate the real issues with Robertson in a public debate, either with the County League of Women Voters or one that would be televised in the region. While Chautauqua County contains 20 percent of the voting base in the 23rd Congressional district, the only local debate Reed has agreed to with Robertson is a closed-door debate with the editorial staff of the Jamestown Post-Journal. Meanwhile, Goodell and Yoakum have already taken part in at least one debate and will take part in several others, including a public debate Oct. 21 at 7pm in Jamestown, hosted by the League of Women Voters.